Participants, businesses and volunteers all played their vital parts in ensuring the 2017 Hertford Carnival was a success, both on the day and for months in advance. The day would not have happened without our sponsors and supporters, organisers and stewards. Disclaimer – Hertford Carnival Committee are not responsible for the content of external websites. Occasionally websites may be taken down by the owners; these web links were current as of 2017. Click here to read about the day, and to see photos of the stalls, performers, fancy dress competition, and everything else that took place. Various levels of support were sought from local businesses, ranging from being a main sponsor to displaying posters and anything else we - or they - could think of! This support from local businesses was essential in making this community event happen. We were very happy to see businesses who had supported us previously being willing to return in 2017! In addition, we had a new sponsor. These kind business partners and supporters for 2017 are detailed below. Thank you! – without your help, Carnival Day 2017 simply could not have happened. A new Hertford business in 2016, Abel are based in Market Place. An independent Sales and Letting agency, their ethic is about building customer loyalty through trust, transparency and integrity. They are also proud to be in Hertford, have committed to keep jobs for local people, and are determined to be involved in local fund-raising events, so we were delighted to welcome them back for a second year of sponsorship! Their services include landlord/tenant services and sales, and useful extras such as a photography drone, long opening hours, and shuttle cars to property viewings. On Carnival Day 2016 they sponsored the fancy dress competition, with director Ami Hayward also acting as one of the judges. They were also very visible around the grounds, with their Pimms stall (drinks and scones were free in exchange charity donations), their pink and blue decorations brightening up the arena, and their white balloons floating up 'accidentally' into the sky, courtesy of all the children! In 2017 director Ami Hayward was a member of the Carnival committee. They also ran their popular Pimms-and-scones-in-exchange-for-donations stall on Carnival Day again. They fed back on their twitter feed; "We had a fantastic time at Hertford Carnival yesterday, and raised over £300 for Isabel Hospice! Thank you to everyone who came out to support not only some great causes but lots of local businesses and our great community in Hertford!" Details of their website are here. 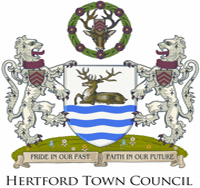 The Town Council have been a key and long-running supporter of the Hertford Carnival. In 2012 the resurrected carnival had key assistance from HTC's members, and the stalls and entertainment took place in the Castle grounds. In 2013 they were a welcome financial sponsor. We were already delighted to welcome them back again for 2014 as a financial supporter. Then, at the end of May 14, the carnival faced not being able to run in its then format and at its current venue of Hartham. 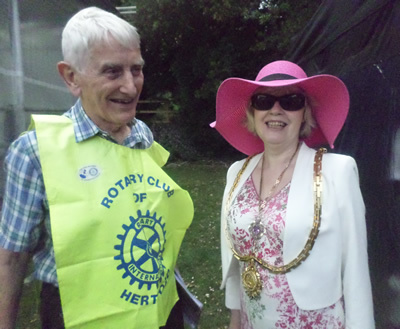 Hertford Town Council stepped in to help, offering to run the 'Carnival at the Castle' with Rotary. Without this support, Carnival Day would simply not have gone ahead. In 2015 the HTC helped to plan the Carnival (again with Rotary), and the event again took place at the Castle. In 2016, the HTC again took on this leading role, and again offered the Castle venue. They also gave us a grant of £800. Carnival at the Castle 2017 once again went ahead with their support. They also gave us a grant of £410 this year. Based in Mead Lane, V&S Scaffolding are a local firm who provide scaffolding services in the town and across London and the South-East. They work on large and small projects, both residential and commercial. Their site is found here. In 2015 they were a new sponsor, and they returned for 2016, and we were delighted to welcome them back for 2017. We'd definitely be in a bit of a pickle without them donating and erecting the stage! Well known as one of the biggest banks in Britain, the Hertford branch of Barclays is on Market Street. Details of Barclays and their current, savings and loan accounts can be found here. We were delighted to welcome them as a new sponsor for 2016. We were delighted to welcome them back for 2017, and they once again very generously pledged to match donations up to £1,000. A full service legal firm, Attwaters Jameson Hill offer a comprehensive range of services from child protection and family law, to wills, tax law, and property. They deal with individual and commercial law. They have four offices - Hertford, Ware, Harlow and Loughton - with specialist teams working in all four. In Hertford they are on Fore Street. Photo; the Attwaters Jameson stall, courtesy of Peter Anson Westbrook. They have a long tradition of involvement in the community, working with the Citizens Advice Bureau and, this year, becoming a new sponsor for Hertford Carnival by donating £500. 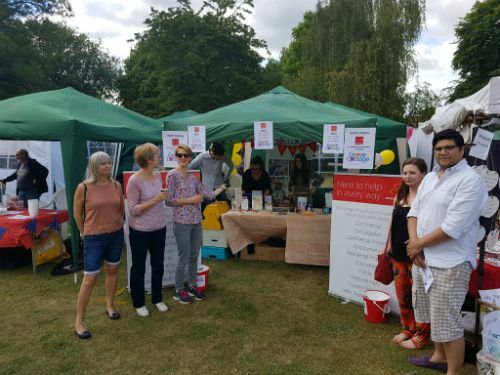 They also had a stall on Carnival Day, and fed back on their twitter feed; "We spent a lovely afternoon at the Hertford Carnival yesterday". Details of Network Homes - who now incorporate Riversmead - are found on their webpage. They own and manage over 19,000 homes across Herts, London and the South East. They are developing over 1,000 new homes a year and invest over £1million annually in economic development, and social and environment projects in the communities they are involved in. As Riversmead, this organisation has been a stalwart supporter from the beginning, backing our resurrected carnival in 2012, donating key money and having a stall in the castle grounds. They continued this support into 2013 through to 2016. We were delighted to welcome them back again for 2017. Anyone who has given us press coverage (see press), who has displayed posters for us, any webmasters who have linked to our website, and anyone who has followed or retweeted our twitter feed. Hertford Tourist Information, who sold quiz night tickets for us. Anyone who provided photos or feedback. Volunteers! - those who helped hand out flyers, mark out the grounds, who set up stalls on the Sunday morning, who helped man the gates or rattle tins, and who helped clear away at the end of a long day. All who have helped in any other way. Our superb stall holders, who provided such a super selection of food, drink, games and goods on the day. Our wonderful performers, who gave us such a great atmosphere on the day. And of course everyone who came along on the day - about 5,000 of you! There was a variety of ways individuals were asked to support the carnival, including planning, marshalling on the day, spreading the word ... And of course coming along on the day! Photo; David Kirby, chairperson of the Hertford Carnival Committee, chatting to the Mayor Sue Dunkley on Carnival Day 2017. Courtesy of Anna Schlenker. 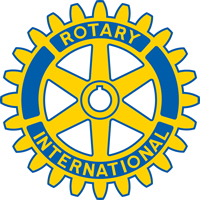 In 2017 it was once again a joint venture between Hertford Rotary Club and members of Hertford Town Council, with other individuals welcome to participate. Due to the large amounts of planning required for a carnival, even a small scale event without a procession, the committee and sub-groups were busy from January 2017 onwards, meeting regularly and progressing numerous actions. Many extra individuals - from Hertford Rotary, the Town Council, and others - helped out on Carnival day itself, performing marshalling, bucket collecting, stall set-up, and other roles with aplomb.